Usually when I warm up my fingers in the morning, it’s in the service of drawing something completely ridiculous. Not so today! 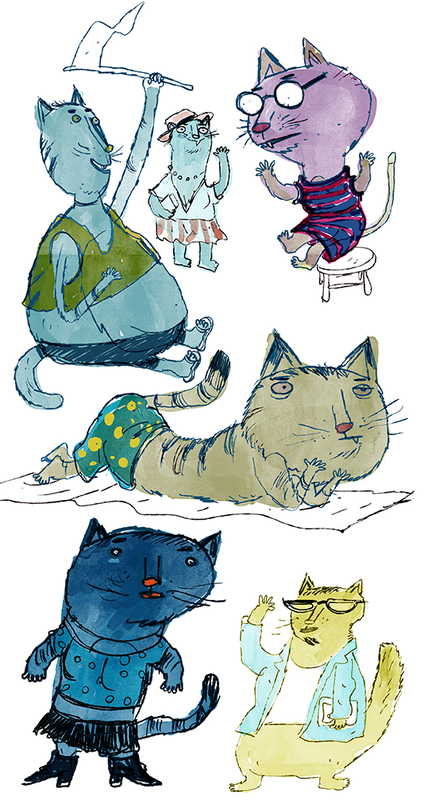 Today, my warm up drawings honor the annual Cat Fashion Day Festival! You probably forgot all about it didn’t you?! Well, I remembered! See you all at the festival this weekend. Hello. I am a volunteer with the Elverta Elementary School in Elverta, CA. We recently started our Library Book Project for the school where we are trying to restock our school and classroom libraries. We are a small school and district in Elverta and have been trying to upgrade and restock our library shelves. Books get very worn and many (many) times books never get returned. We are thrilled and excited that our students love to read – our challenge is to keep a good supply of books in the library, especially newer hardbound titles. Our library book project is to reach out to parents, family, friends, and businesses to seek help in getting book donations. We ask parents to clean out their bookshelves and donate what their kids don’t read anymore, so a new group of younger kids can enjoy the books. We are doing what we can to restock our shelves, especially for this new upcoming school year. The cost of buying brand new books can be a bit prohibitive. I am reaching out to you in hopes you might be interested in donating some books/bookmarks towards our library.